From the architect. The maritime / dive bar theme for the scheme is a direct response with the bayside suburb of St. Kilda. 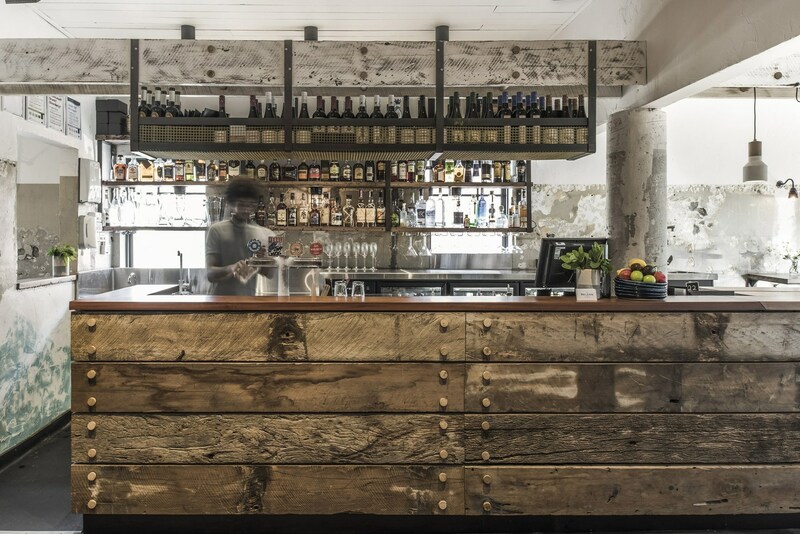 Recycled timbers recovered from Melbourne’s docklands are used throughout the scheme to form all joinery items and to help create an authentic timeworn aesthetic. Based on a jetty / pier, the timber clad bar serves as the main feature of the scheme as it runs centrally through the existing longitudinal space. This allows customers to sit on either side bar allowing them to chat directly to bar staff giving the place an informal ‘local pub’ feel. A hand painted mural of a mythical sea creature ‘The Kracken’, is located at the back of the space adding another layer to the maritime theme of the space.